Crager Real Estate has been rapidly growing as an independent real estate agency over the years. This growth gained the attention of various franchise-type real estate companies. Several of them contacted us about becoming a part of their organization, but none of those opportunities felt right. We wanted to make sure we did not lose our identity by combining with another organization. When it boiled down to it, after extensive research about the opportunities, Berkshire Hathaway HomeServices started to lead the way. As soon as we connected with Berkshire Hathaway HomeServices, things began falling into place. Berkshire Hathaway HomeServices clearly started defining itself from the pack by showing they would allow us to maintain our core values. Instead of coming in and changing current models, Berkshire Hathaway HomeServices presented themselves as an opportunity-filled partnership. They kept what we were already doing really well, but they will help us in getting to the next level, not only in production and processes, but future growth plans as well. Crager Real Estate has grown exponentially, to the extent that our office could not really maintain independent status at this point. The next step was to either incorporate, which means hiring employees and revamping processes amongst ourselves, or look to see if there was an already existing model that could improve the processes without internal expense. Berkshire Hathaway HomeServices presented the perfect opportunity. While we have developed a huge following in the local market on our own, we can now compete in any market whether it be locally, statewide, or even nationally with referrals and the ability to reach other agents within the system nationwide. First and foremost, clients can rest assured they will not lose the Crager Real Estate touch during this transition. They will still have their current agent, our customer-centric approach, and all the attention to detail they value. There’s just going to be an extra layer added to the Crager Real Estate product. For a seller, for example, the exposure and marketing deliverables are going to be at a higher level than what they were before. For a buyer, it allows more searching and research capabilities, plus the ability to buy outside of the central Ohio market if necessary. We also have the ability to refer buyers to other Berkshire Hathaway HomeServices agents who have a like-minded set of morals and standards. For our sellers, the biggest advantage is the exposure. We now have access to a complete luxury division, which did not exist previously. It is a whole different way to market luxury properties. There is also a commercial division, so we are linked up with all the Berkshire Hathaway HomeServices commercial agents around the country. This offers data exchange and marketing for our commercial clients on a national platform. 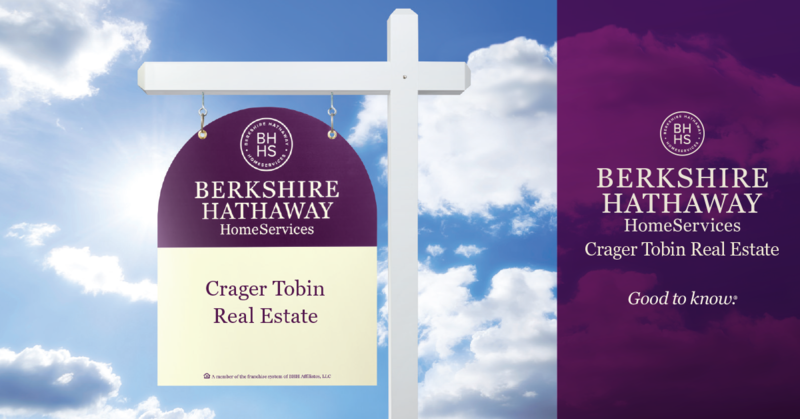 For Crager Real Estate, the growth opportunity Berkshire Hathaway HomeServices presents is the most promising aspect of the partnership. We have the chance to elevate our local market, putting us on the map in a way that wasn’t possible before. Suddenly, central Ohio listings are going to be advertised in the Wall Street Journal. Our market may not have been recognized for luxury and resort purposes before, but now the next level of luxury marketing is available to us. The chance for expansion is huge. For our internal team, we are excited about the processes and data systems. Though they are less noticeable on the consumer end, it is going to help set us apart in the future. It’s really going to bolster our company, making it attractive to new agents while maintaining the current crew. There’s an elegance and luxury to the Berkshire Hathaway HomeServices name. Berkshire Hathaway HomeServices Crager Tobin Real Estate will be staying in the same office location. On the horizon, the agents are looking forward to a truly better experience for their clients, as well as a better, simpler process on the business side. While the name recognition will attract more individuals to our market, our personalized experience will remain the same as it has always been.